Shining light on strong women from the Book of Mormon, this groundbreaking book shares well-known stories alongside others that may be less familiar. Come to better know and love Sariah, the heroic daughters from the land Zeniff, Nephi's wife, the maidservant spy, and other women from the Book of Mormon who chose God with all their might. These faith-filled women defended their families, protected their husbands, and risked their lives for others—providing powerful role models for us all. With stunning illustrations, ten compelling narratives, and thought-provoking family discussion questions, this volume will give you a new perspective on the Book of Mormon. 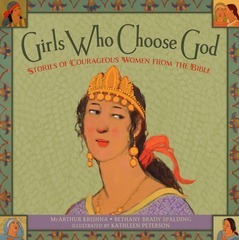 Reading and reflecting on these brave women's stories, girls and boys will learn that they too can be strong and choose God. In buying this book, you support educational opportunities for women. A portion of the authors' proceeds will be donated to nonprofit organizations in their local communities. McArthur Krishna comes from a pack of storytellers. With a master's degree in communications from BYU, she co-owned Free Range, an award-winning marketing business focused on telling social justice stories. After she moved to the Magic Land of India, she got married and started writing books and raising kids. More of her stories can be found at mcarthurkrishna.com. Bethany Brady Spalding likes to stir things up in the kitchen and in the community. She has founded programs to promote health and nutrition in the USA, South Africa, and India. Bethany currently leads a regional coalition in Richmond, Virginia, to create a healthier food environment for at-risk children. She finds joy eating spicy dishes and exploring wild places with her husband, Andy, and their three fiery girls. Kathleen Peterson has illustrated twenty books, mostly for young people, on topics ranging from world religions to Hawaiian legends. Her art can be found in galleries throughout the West and at www.kathleenpetersonart.com. She and her husband, Steve, live on a farm in Spring City, Utah. it was pretty short but it was a wonderful book. The Book of Mormon has some great heroines in it as well as heroes, but it is easy to forget this since a number of them are not mentioned by name. But the role these women played in there world was no less important than the men and truly inspiring. One of my favorite female stories in the Book of Mormon revolves around the power of mothers to influence their children for good. The mothers of Helaman's stripling warriors lead their sons down a righteous path that led to their survival in the face of incredible odds. And the other women mentioned in the book are just as inspiring and a powerful reminder of the good that women can do. Each story is briefly summarized and then a choice made by the woman or women involved is presented for discussion. The decision made is then presented on the following page. Not only is the book an inspiring one but arranged neatly for teaching during family home evenings and other times. Recommended. I loved the first book in this series, which focused on women in the Bible. The format for this one is the same: Each story is briefly summarized and ends with a choice. You turn the page to find out what the woman (or women) chose and how it affected her life. Then there is a question to ponder and discuss and additional scripture references. I also like how they included "Family Discussion Questions" at the very end which go a little deeper into each section and will help keep the conversation going. The illustrations are authentic and add to the message in the book. Sariah and Abish are the only women that are actually named. The rest are: Nephi's wife; the sisters of Nephi, Laman and Lemuel; women who listened to Alma; daughters from the land of Zeniff; Lamanite queen (Lamoni's wife); Morianton's maidservant; mothers of the Stripling Warriors and girls and boys blessed by Jesus. There is much we can learn from each of their lives and this book highlights the individuals and groups well. This is a book I will read and refer to often! I received a copy of this book to review. My opinion is 100% my own. What a wonderful book for girls and women! I loved reading through this quick and fast read. It was so elegantly written. So, I know that any young woman like myself, and women alike will have much fun bringing their daughters closer to the women in the Book of Mormon. It is so needed in the world, especially for young girls, young women, and ladies to know that their are strong women in the scriptures. I love the pictures, or art work done in this book. It is phenomenal and gives character to such a fun read. I loved it! Who's Your Hero? For Girls!